22 // VARSITY May 15, 2014 ' ' ASK THE BADGERS ' ' QUESTION OF THE WEEK: What advice would you give incoming freshmen about going to school at UW? 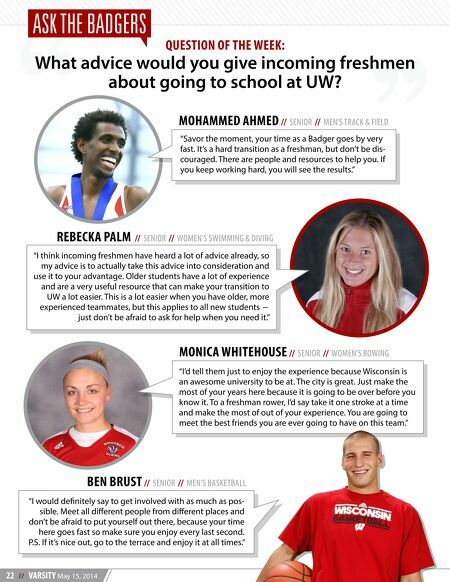 MONICA WHITEHOUSE // SENIOR // WOMEN'S ROWING MOHAMMED AHMED // SENIOR // MEN'S TRACK & FIELD REBECKA PALM // SENIOR // WOMEN'S SWIMMING & DIVING "I'd tell them just to enjoy the experience because Wisconsin is an awesome university to be at. The city is great. Just make the most of your years here because it is going to be over before you know it. To a freshman rower, I'd say take it one stroke at a time and make the most of out of your experience. You are going to meet the best friends you are ever going to have on this team." "Savor the moment, your time as a Badger goes by very fast. It's a hard transition as a freshman, but don't be dis- couraged. 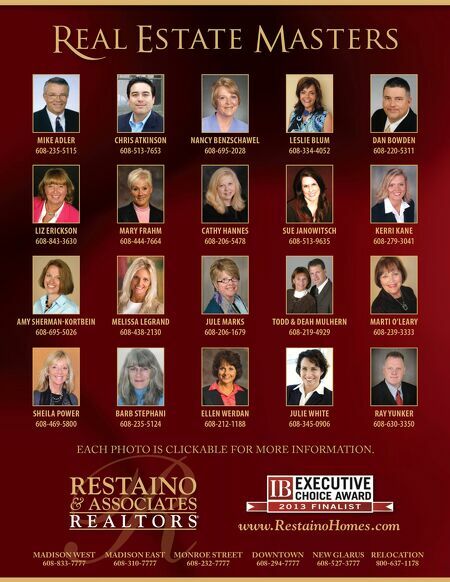 There are people and resources to help you. If you keep working hard, you will see the results." "I think incoming freshmen have heard a lot of advice already, so my advice is to actually take this advice into consideration and use it to your advantage. Older students have a lot of experience and are a very useful resource that can make your transition to UW a lot easier. This is a lot easier when you have older, more experienced teammates, but this applies to all new students ― just don't be afraid to ask for help when you need it." BEN BRUST // SENIOR // MEN'S BASKETBALL "I would deﬁnitely say to get involved with as much as pos- sible. Meet all diﬀerent people from diﬀerent places and don't be afraid to put yourself out there, because your time here goes fast so make sure you enjoy every last second. P.S. If it's nice out, go to the terrace and enjoy it at all times."